Today we read about Thomas Vander Veen’s military activities in France from October 28-30, 1918 along with Natalie Fulk’s comments. ● Comments: Vander Veen was chosen to participate in a leave, which was like a vacation. Leaves were when commanders would “grant seven days of leave every four months for officers and men ‘of good standing’ in their units.” The YMCA would help organize these trips and men would be able to go on a vacation to tourist spots around France and relax for a few days in appreciation of their good service. They received other benefits besides the trip itself during their leave, such as money and clothes, as Vander Veen experienced. Leaves were supposed to help boost morale within the AEF. ● Comments: Vander Veen’s leave took place in Mont Dore in the southern part of France. Mont Dore was a resort village known for the mountain scenery and activities such as thermal springs and hiking. Now, it is still a tourist destination, especially for winter sports like skiing. ● Comments: This was Vander Veen’s first day getting to explore Mont Dore and what it had to offer, even though he was feeling sick still. Soldiers from all over France had come to Mont Dore on leave. Thomas Vander Veen was a Dutch-American soldier in World War 1 who fought on the Western Front in France. His main job was as a messenger and he carried messages between his company commander at the front and the Post Commander at the rear. He wrote a journal of his experiences in the war which starts on September 22, 1918 and ends with the armistice at the end of the war on November 12, 1918. After the war ended, he earned a Distinguished Service Cross for his bravery in delivering messages, specifically in battle from October 10-13, 1918. His journal is an extraordinary first-person account of the end of World War I and provides a personal narrative of one man fighting on the Western Front. 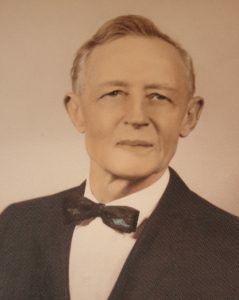 According to his nephew, Gus Vander Veen, Thomas Vander Veen immigrated to the United States from the Netherlands sometime before the beginning of World War I and was living in California. When the war broke out in Europe in 1914, the Netherlands called back its citizens who were residing abroad to join the Dutch army in preparation for potential conflict. However, Vander Veen decided not to go, and was drafted instead by the United States Army when he was 30 years old. Through the process of being in the army, Vander Veen gained his American citizenship. This blog will share Vander Veen’s experiences with readers exactly 100 years after they happened and give a day-by-day depiction of what Vander Veen and his fellow soldiers went through at the end of World War I. 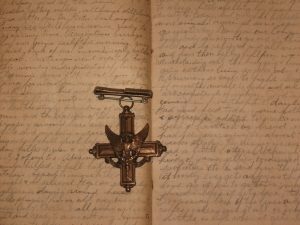 The blog posts will contain Vander Veen’s journal entry about a specific day. He did not write every day, but often compiled many days into one entry, but these entries have been split into separate days to give the reader a sense of the passage of time and the events of each individual day. The blog posts will also include comments from the compilator, Natalie Fulk, on the historical context of his experiences. Fulk is a 2018 Hope College alum. ● Comments: While Vander Veen started writing his diary on October 2nd, 1918, he began describing events on September 22nd, which he thought was the 23rd. He says at the start of his diary before beginning to describe the events of Sept. 22, “Wednesday Oct. 2 or Thursday Oct. 3: I don’t know which, opinion is divided, it’s hard to keep track of the days and dates, events have passed and crowded each other so much. By figuring it all out, I have come to the conclusion it must be Wed. Oct. 2.” It must have been very difficult to keep track of the date while hiking in the woods in France with little contact with the outside world. He was stationed in France with Company C of the Fourth Division of the American Expeditionary Force. Vander Veen and his company would stay in La Perche for two nights before leaving for the front lines. ● Comments: The company spent two nights about 5 miles away from the front line of the conflict in France before moving out. Vander Veen and his company were on their way to the front line to join the Meuse-Argonne offensive, a battle on the Western Front between the Allies and German troops.The Allied force was made up of American, British, and French troops. The main objective of the Meuse-Argonne offensive was to drive German troops out of the Meuse-Argonne region, where they were heavily entrenched. The Germans used the Meuse River and the Argonne Forest to their advantage to create strong defensive positions. ● Comments: Vander Veen’s company arrived just as the Meuse-Argonne offensive was beginning. The Allies meant to drive the German troops out of their holdings in the area. Vander Veen’s guess that the offensive was larger and would take longer than his commander said was accurate, as his division was one of nine AEF divisions that were involved in the attack. ● Comments: Vander Veen was acting as a messenger for his colonel during the battle and stayed by his side. Seeing the German observer plane downed was very encouraging to the men even though the company had a hard day of battling and retreating. Any sort of victory was a morale boost to the soldiers. ● Comments: Vander Veen was now attached to an unidentified major as his company moved forward again. It was difficult for the American forces to attack the German defenses for many reasons. The Germans used trenches, barbed wire, artillery, mortars, and machine guns, such as the ones used on this day on the snipers, to keep the Americans at bay. ● Comments: While Vander Veen thought it was Saturday, according to a calendar from 1918 and his description of events until this point, it was actually Sunday. Vander Veen’s company had been fighting at the front for several days before being relieved to reserve. After this entry, Vander Veen did not write until four days later on Thursday, October 3. 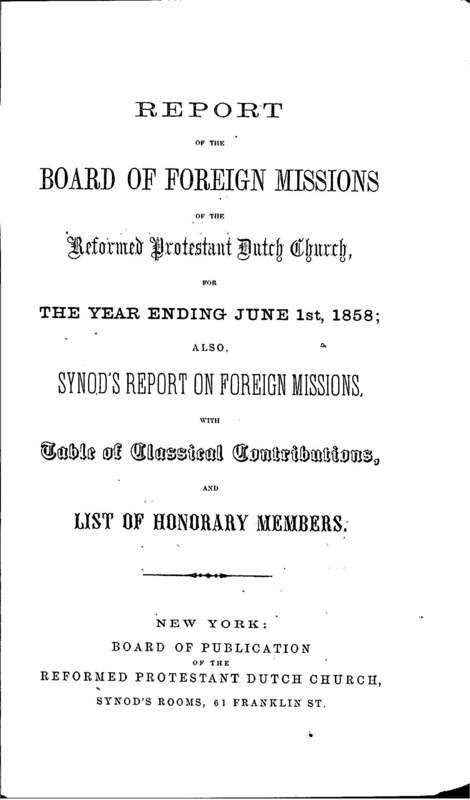 The Board of Wold Missions annual reports and Women’s Board of World Missions annual reports are now online for the researchers to use for research. 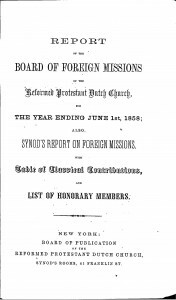 This additional material is part of the Joint Archives of Holland at Hope College’s ongoing mission to make available rare and unique archival materials to researchers around the world.